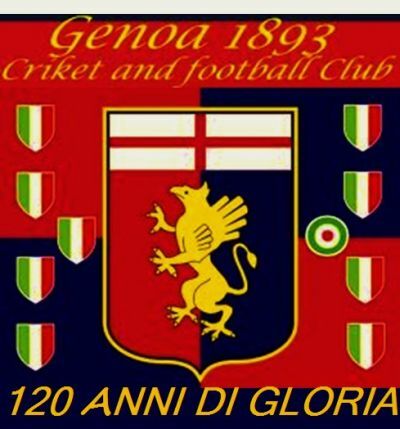 A good year for our Genoa that celebrated the 120th anniversary this year. A very bad year for the clubs in Milano with A.C. Milan and Inter on the fifth and eight position. As we already saw in the late goals of Cagliari and Atalanta in injury-time and the many players with cramp the last matches, our team is tired. After Liverani was substituted by Gasperini the team had to train very hard to reach the right physical level. Now the players are tired and they want a little vacation. Trainer Pioli had to win with Bologna to reach Christmas as coach of Bologna. Genoa missed Kucka and Portanova who were substituted by Konaté ad Gamberini. The typical 0-0 match was decided by the best player in the field: captain Diamanti. With a very hard shot he beat Mattia Perin in the 57th minute; 1-0. After the goal Bologna did not want to play anymore and Genoa couldn’t. Gilardino was injured on his shoulder after one of the crazy fouls of Perez and was substituted by Calaio. The only shot on the goal of Bologna was made by Vrsaljko. With this bad match 2013 ends on the 9th position in the standings, 6 points above the relegationarea. The next match is 6th January against Sassuolo, 3 points are necessary! 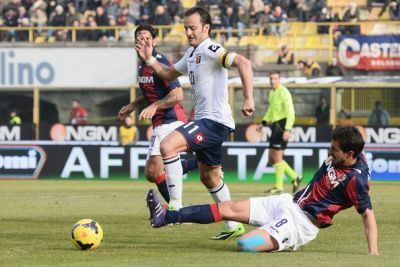 Last week Sau of Cagliari scored the deciding goal against the 10 players of Genoa in the last minute of injurytime. This time in Marassi it was De Luca of Atalanta who scored the equalizer (1-1) in the 93rd minute. Honestly Atalanta deserved the draw, but it is always very nice if you win a match without earning it. The goal of Genoa was scored by Andrea Bertolacci halfway the second half. Genoa missed defenders Portanova (injured) and Manfredini (banned after his red card last week) and midfieldplayers Vrsaljko and Kucka (both injured, Kucka for 4 till 6 months). Next week Genoa plays the last match of 2013 in Bologna. Manfredini and Vrsaljko can both play in the city of the two towers, Portanova is doubtful to play against his former team. Let’s hope this match stops in the 90th minute without injury-time and we can celebrate our 500th victory in Serie A. Since the comeback of Mr. Gasperini our boys only lost in Juventus-stadium. Of course we were lucky that Milan did not score the deciding goal in San Siro a few weeks ago and last week Torino was stronger than us, but it was also the power of our defense and Mattia Perin in particular that we didn’t loose these 2 matches. 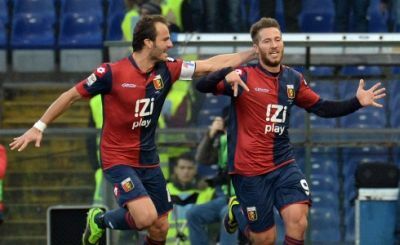 In Cagliari – without banned Matuzalem – Genoa scored the openinggoal: Gilardino again found the net after a great assist of Lodi. During the rest of the first half the teams were equal without great chances. Two minutes before halftime a corner to Genoa and the players of both teams pushed against each other as with every corner. 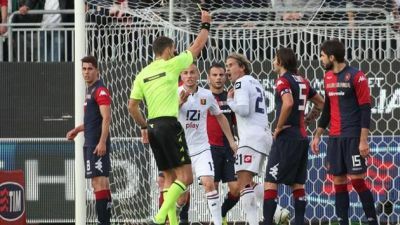 Captain Conti of Cagliari seemed a little aggressive so he got a yellow card, but as a complete surprise also Manfredini who already had a yellow card earlier in the first half, so Genoa had to play the rest of the match with 10 players. 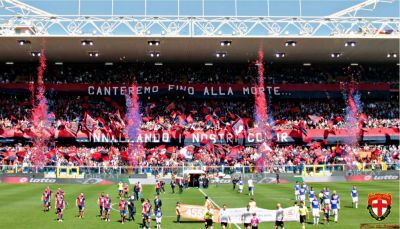 In the second half also Conti deserved a second yellow card, but Giacomelli saved him and Cagliari that scored twice in the 76th and 93rd minute: 2-1. An unnecessary defeat of the match, but we also lost Juraj Kucka (4 till 6 months) and Daniele Portanova (2 till 4 weeks) with heavily injuries. A black Sunday that seemed so nice till we got a corner in the 43rd minute.